You can return to our abutilon page or browse the pictures using the next and previous links. New purchase today, in the sale, for £4! I've been looking at these for a while, but the price swayed me today! Well done, what a lovely flower. Yorkshire - it stand about 30 inches high. Louise - what I have is a collection of plants that I like. The "garden" will have to wait until I sell up and retire! Collection are good, Meanie, all for that ! That's quite a lady you have there! Lovely color. I really like Abutilons in general, but this one in particular GG! What kind of soil and climate does it prefers Meanie? This one is frost tender Camillia. I will chech the links out, thanks Meanie. This plant will tolerate quite a bit of frost to at least 23 degrees F/ -5 degrees C. When I lived in the San Francisco Bay Area I would see many varieties of Abutilon growing in the frost pocket areas inland and thriving. I had many varieties myself when I lived in the San Francisco Bay Area...but the city where I lived rarely had more than 2 or 3 days of light frost each winter with temps rarely below 35 degrees F/ 2 degrees C.
Not worth the risk I think as it's still a young plant! Maybe next winter with a fleece. If you plant one into the ground (next spring), you'll see how quickly it will grow. They are super easy from cuttings (I received all my plants from cuttings from friends). I literally just stuck the cuttings into the ground and watered. The cuttings quickly grew to 8 feet/ 2.5 meters. Here in San Diego they seem to take longer to grow large like in the San Francisco Bay Area. I think it's because of the horrible soil here. My plant in the front yard is 5 years old and only 5 feet/ 1.5 meters tall. Delonix - I'll try some cuttings next year. Thanks for the tip! Faerieflora - it certainly is! 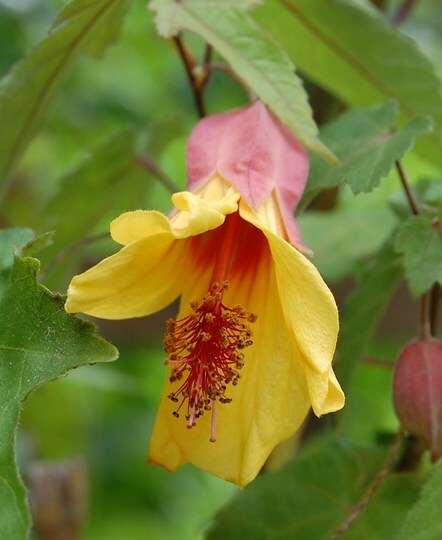 See who else is growing Abutilon megapotamicum (Trailing abutilon). See who else has plants in genus Abutilon.